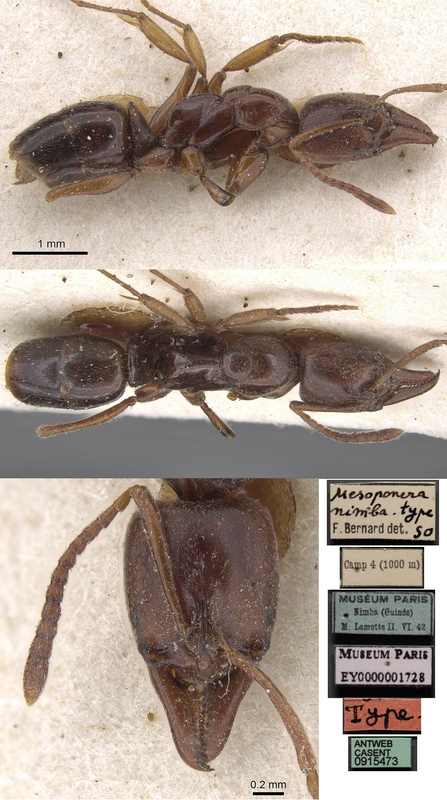 Type location Guinea (Euponera (Xiphopelta) villiersi, Bernard, 1952: 193, illustrated, worker; in Pachycondyla Bolton, 1995: 311; new placement by Schmidt & Shattuck, 2014: 111) from Mt. Nimba, from termite hill at 700 m, (ix-1946, Villiers); holotype and two other workers; worker only described (see Bolton, 1995) . TL 5.3-5.6 mm, HL 1.35 HW 0.90 mm. A very distinct form. Colour pale reddish, clypeal margin and part of gaster darker, appendages dark-yellow. Head very finely shagreened, somewhat shiny, remainder smooth and shiny, puncturation fine and rare. White pubescence on head and thorax, plus erect whitish hairs (less dense than on picea). Head with clypeus uniformly convex and smooth apart from some puncturation, laterally narrower than related species. Eyes black, flat, elongated, with 20 plus facets; some 2.5 times further from mandible bases than own length. Mandible with 13 teeth, small, black and spaced out, more inequal than Pachycondyla picea. 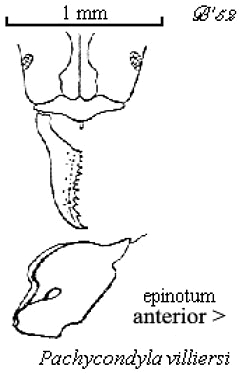 Propodeum notably more humped in profile than close relatives; posterior to the hump the declivity is twice as short, flat, and limited laterally by fine borders. The photomontage of the type worker is collated from http://www.antweb.org/specimen.do?name=casent0915473 . The photomontage is of a worker from Liberia, Liabala; collector E Poiriet (Liabala PF 9).